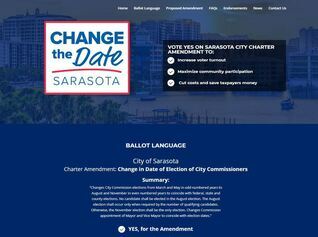 now known as "Change the date"
For nearly 100 years, your chamber has cultivated Sarasota’s prosperity and quality of life through our members’ business leadership and action. As we enter 2018, that tradition continues. Business leadership, through The Chamber, focuses on two areas: opportunities and problems. It identifies opportunities and removes the problems that would impede them. It also identifies problems and finds opportunities to solve them. Sarasota has a problem, and we are presenting an opportunity to solve it. The foundation of a representative democracy is rooted in the principle of voter participation. Our democracy suffers when nearly 80% of voters either do not or cannot participate. That is exactly what is happening is the city of Sarasota and the community deserves better. ​For decades, the city of Sarasota has held its municipal elections in the spring of odd-numbered years. Those elections tend to draw a voter turnout at or around 20%. During ordinary elections, the turnout is two or three times that. In the last city election, held in May of 2017, just less than 23% of city voters participated. In the last general election, held in November of 2016, almost 72% of city voters participated. More than 18,000 additional ballots were cast by city voters during the ordinary election. Interestingly, the city pays additional dollars to hold these off-cycle elections. Each spring election costs the city upwards of $100,000. The city can participate in ordinary, fall elections for free. Business principles wouldn’t have you paying for less than what you could otherwise get for free, and our community shouldn’t either. Furthermore, what the data shows us is that special, spring elections have a dilutive effect on certain sub-sets of voters. Along with an overall increase in voter participation, a move to ordinary election cycles would see a significant increase in the composition amongst African-American, Hispanic, and under-30 voters. In order to move elections to coincide with ordinary elections, the issue must be placed on a ballot for voters to decide whether or not they would like to move the dates. In order for voters to be given that opportunity, 10% of voters must petition the city to do so. It is that opportunity that we are seeking to provide through the Decide the Date initiative. Alongside a number of community partners, we are diligently working to deliver voters the opportunity to choose when they wish to participate in local elections. It is through your Chamber that this community can work towards being proud of its civic engagement. That, after all, is a quality of life issue and your Chamber stands at the forefront cultivating our quality of life. We encourage you to visit DecideTheDate.com for information and updates on this critical, community initiative and for you to reach out to Chamber President, Kevin Cooper with any questions you might have. We hope that you will find ways to further support your Chamber as we seek to solve this problem. Follow this initiative on Facebook and Twitter for updates. ​Continuing the 1 mill will enable Sarasota county schools to continue offering extra educational opportunities. The extra mill is a major reason why Sarasota County schools are at the top. Sarasota county school district has been “A” Rated since 2004, when ratings began. We can take pride in our children’s academic achievements. Our students rank in the top five highest Florida Standards Assessment (FSA) scores in the state.Our district is one of only two districts that have been continuously rated an “A” district. What’s more, in standardized testing such as the SAT, Sarasota County students outperformed the nation and state. Since 2002, Sarasota County voters have approved an extra 1 mill of funding that has made critical differences in student performance. The 1 mill also allows an additional 30 minutes of education every day, helping graduate top rated students with the science, technology, and math skills needed for college or to be competitive in the job market. The additional funding allows the Sarasota school district to continue offering art, drama and music. Sarasota County schools are recognized for outstanding arts education by the John F. Kennedy Center for the Performing Arts, and the National School Boards Association. Continuing the 1 mill will enable Sarasota to keep offering extra educational opportunities. The extra mill is a major reason why Sarasota County schools are at the top.